The German surname Bretzke is believed by etymologists to be of two origins. In the first place, the surname Bretzger is of toponymic origin. Toponymic names are those surnames which derive their origin from a place name near which the original bearer lived or held land. In this instance, the surname Bretzger is derived from the place name Bretzingen in Buchen and Baden. In the second place, the surname Bretzger is of occupational origin. Occupational names are those surnames which derive their origin from the trade or profession of the father of the initial bearer of the name as a surname. Here, the surname Bretzger is an old Swabian form of Bretzler meaning "pretzel baked goods", from the German word "brezel", meaning "pretzel", thus referring to "one who baked or sold pretzels". The earliest accounts of the Bretzke name come from a place once called Stettin, Prussia, which is now Poland. Many of the Bretzke families around the world once came from this area known as Prussia, Pommerania, Pommern. 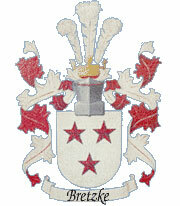 Other spellings of the name include Brietzke, Breitzke, and Britzke. Stettin (Polish name: Szczecin) is a city with over a thousand years of tradition and a turbulent history. The city was for many centuries one of the most powerful ports and trade centres in the German world. 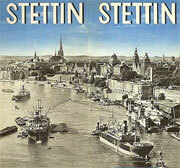 The history of Stettin began at the turn of 7th and 8th centuries and over time was ruled by the Polish, Prussians, French, Danish and Germans. Today, Szczecin is a city with a population of around 400,000, situated in the north-west of Poland, where the river Oder meets the Baltic Sea (through Szczecin Bay). The purpose of this site is to build a Bretzke Family Tree and hopefully make connections with the different Bretzke families around the world. I welcome all comments and suggestions. Most of the content on this site was contributed by visitors like you. Please feel free to forward information that you would like to share about your family history. I live in the San Francisco - Bay Area, USA.